Drains clog over time in kitchens, greases, soaps and more build up on the walls of the pipes and cause a blockage. In bathrooms, showers, tubs and sinks become clogged with hair and soap, and toilets can become clogged with toilet paper. When this happens, you need the help of a plumber experienced in drain cleaning. While there are products on the market those offers a do-it-yourself remedy, these oftentimes offer only a temporary fix and can cause bigger problems later. Our technicians have the proper tools to rid your drains of their clogs without damaging your pipes or the environment. For all of your drain cleaning needs, call us - the local experts! To schedule a service call, request an appointment, or if you would like to speak to a Service Technician, please call our toll free number. 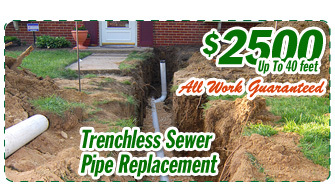 Trenchless Main Sewer Line Replacement Only. © 2019, Cal Green Plumbing. All Rights Reserved.